Chapel Hill is a tribute to where the owners first met and their way of sharing that magical moment with others. This one bedroom, one bath charming little cabin, tucked atop a hill that backs up to mature wooded trees is a wonderful place to connect or reconnect. With a king bed and a queen sized pull out sofa, it's great for a couple or small family. 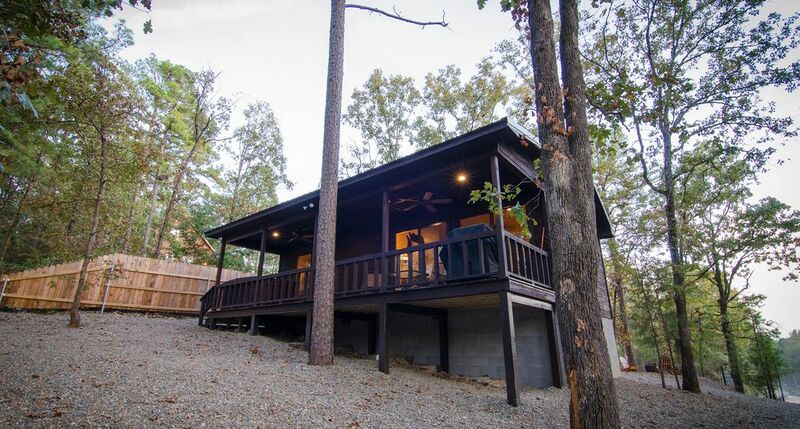 Included is a hot tub, wifi, cable, DVD player, charcoal grill, dishwasher, washer & dryer and firepit which makes Chapel Hill one of the best landings to enjoy all that Hochatown and Beavers Bend State Park have to offer. Last but not lease, this cabin is friendly to your furry companions, so bring them along to enjoy the fresh air! Close to the Beavers Bend state park entrance. The pet fee is an additional $25/night for 1-2 pets and $50/night for 3-4. A maximum of 4 is allowed. Cabin had everything you need for a little get away. Place was clean and well equipped. It is probably most ideal for a couple rather than a family, but we thoroughly enjoyed our stay! Perfect for a couples getaway. Cabin was super clean like brand new construction. Hot tub was great and conveniently right on the deck under cover. Easy access to Hochatown, Beaver's Bend, and Broken Bow. Property managers were easy to reach and helped with a couple of adjustments to our stay. The only drawbacks to mention were the lack of a fireplace and the seating in the living room could use an upgrade. Top notch, would do it again. We spent our 10 year anniversary here and it was perfect just the rite size for a couples getaway. Chapel Hill had everything we needed for a weekend getaway! The cabin was perfectly furnished and in a beautiful setting. We loved our time there. We really weren't that far from the highway to the actual park, but we had the feeling of being all by ourselves in the woods! It was relaxing and restful. The cabin had all the amenities of home. We will be back. Loved it! Super sweet little cabin in a great location!